With Christmas just a couple of months away (not to mention Black Friday and Cyber Monday in between), savvy brands will already have their seasonal content marketing strategies in place. 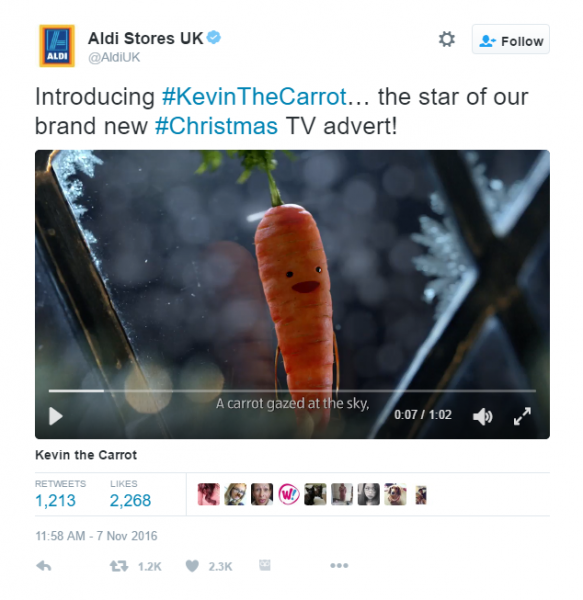 For those looking for festive inspiration, we take a look back at the buzz Aldi created with its Kevin the Carrot campaign in Christmas 2016 and identify the key factors behind its phonemenally success. The budget supermarket spurned schmaltz and focused on humour and parody in its hit Christmas 2016 campaign. In fact, belying the Night Before Christmas-style narrative and Home Alone track, there was a rather dark sense of foreboding that Kevin was going to end up in a Christmas dinner (signalled by a frankly disturbing scene of our hero witnessing a relative’s dying breaths on a dinner plate) rather than fulfilling his dream of going on an adventure with Santa and Rudolph. And this tongue-in-cheek approach was for many a welcome antidote to the usual outpouring of sentimentality we’ve come to anticipate from our retailers in the run-up to the festive season. Aren’t we over Christmas adverts now? The Christmas advert campaign is still very much alive, and continues to permeate far beyond TV-only, utilising multiple channels. In fact, over half of mums in a Channel Mum survey said that they now watch festive ads on YouTube or other social media channels before the TV. And they still they still make an impact, with 60% of respondents admitting to Channel Mum that they’ve cried over a Christmas advert. Celebrity endorsement seems to have fallen out of favour in recent years, with brands such as Iceland and TalkTalk focusing instead on authenticity and real people and families. So what was the appeal of an animated carrot on a quest to enjoy the perfect Christmas? Realism is of course a strategy that has worked for many years… but the tried and tested formula is in need of a shake-up. We live in a world where it is much easier to engage emotionally with an audience by detaching them from real world issues and connecting them with the things that make them happy. 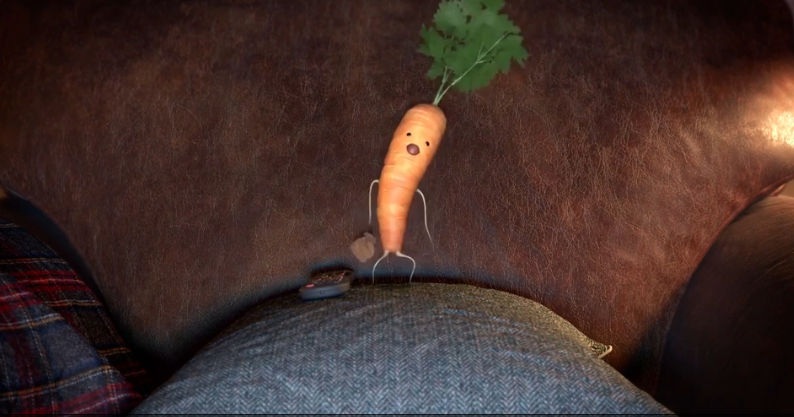 And perhaps this is why Aldi succeeded last year, wuith its tale of a cheeky, ambitious – and strangely empathetic – vegetable’s festive adventure. At its heart, Aldi’s ad campaign was best-in-class content marketing, integrating a range of different media platforms as part of a cohesive overall strategy that conveyed a clear, consistent message and work towards a common goal. Kevin’s story didn’t end with the first advert. The story started with an ad in which Kevin embarked on a ‘dangerous quest’ across a table laden with Christmas food, so that he could reach the mince pie he spotted had been left out for Father Christmas hoping that he, too, would end up on the sleigh. This left viewers to wonder what will become of the loveable legume, keeping the campaign fresh. There was even ‘behind-the-scenes footage’ of the ad’s casting session…. Connecting with customers on an emotional level by making them laugh is a powerful way to encourage engagement – and emotionally driven content is more likely to be shared with others. 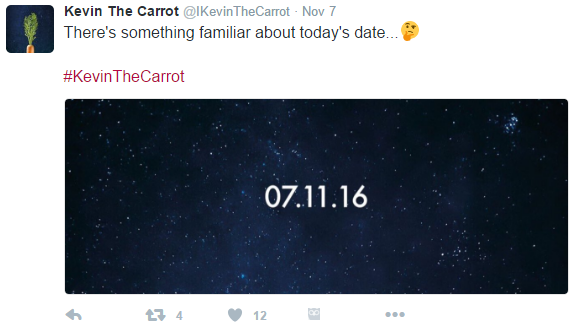 Kevin had his own Twitter account (and still does), which documented his day-to-day life during the 2016 campaign and of course, his ongoing quest to experience a Christmas miracle. He also kept his fans coming back by interacting with their comments, making silly jokes and posting amusing images, such as the parody of the well-known ‘what my friends think I do’ meme. Aldi integrated online and offline marketing seamlessly. 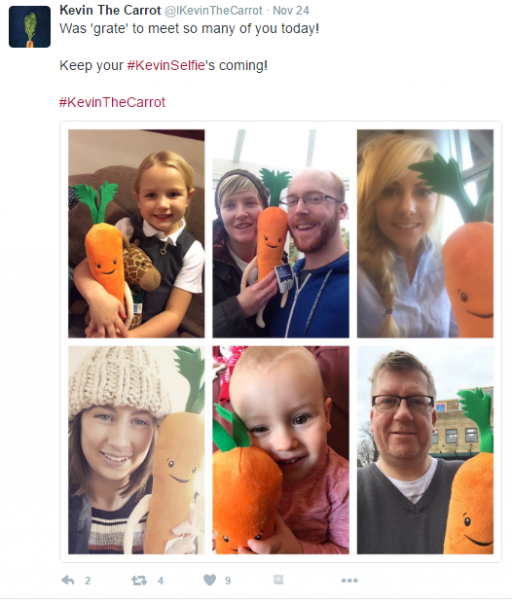 Alongside the obvious online activities, the brand continued to build hype offline too, with a limited edition Kevin the Carrot soft toy, which was an immediate sell-out amid ‘Kevinmania’. 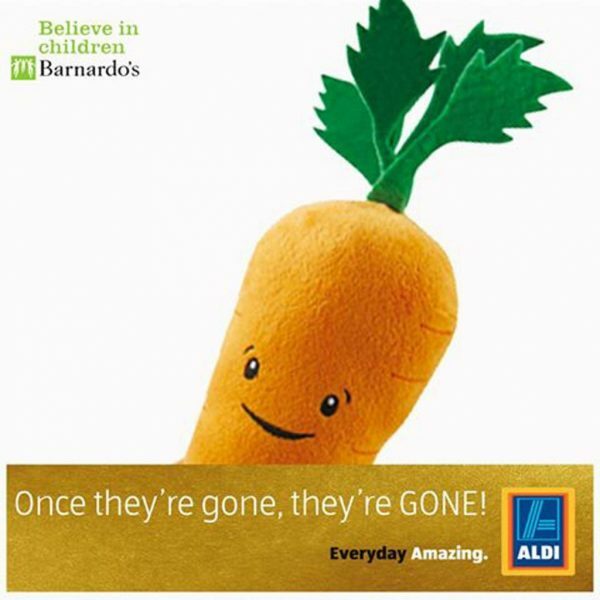 Aldi’s campaign showcased the supermarket as a fun company that cares about and understands its customers, who might be cynical about the John Lewis hype and sentimentality and looking for something simpler – much like the humour and slightly sinister undertone of the Kevin ads. 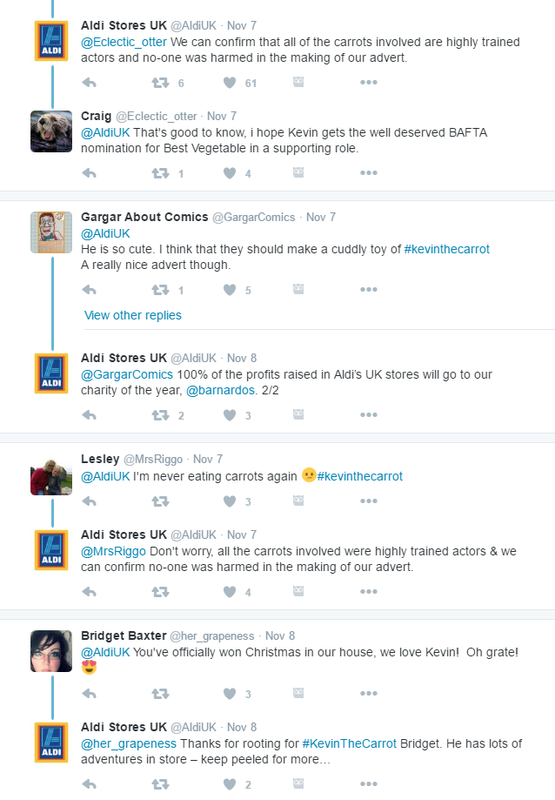 As well as the suspense of the narrative as we wait to find out whether Kevin achieved his Christmas dream, Aldi began teasing audiences via Kevin’s Twitter account prior to the ad’s launch. 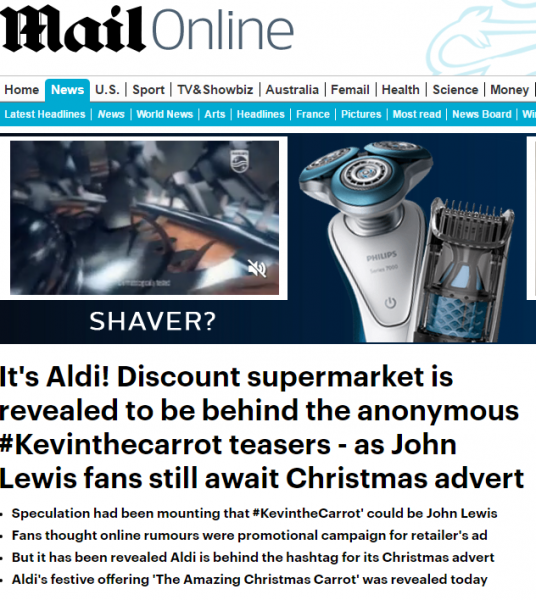 This began with speculation that all would be revealed on Monday 7th November, without actually disclosing the advertiser – and even planting red herring clues that John Lewis could be behind it all with messages such as ‘Orange is the new ‘Man on the Moon’. This proved to be a savvy move which generated a huge amount of media attention and engagement before the ad was even released. Subtlety was key to this campaign – there’s no hard sell, no particular Aldi products being pushed in front of you – just a simple, engaging story. Ultimately, this quietly positioned Aldi as the go-to Christams grocery store this. The fear of missing out can be a potent motivator to take action and is known as the scarcity principle. 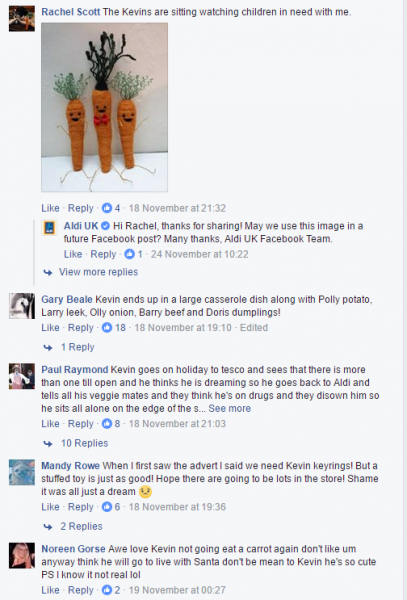 Aldi created excitement not only with its mysterious countdown campaign on social media, but also with the release and hype around the limited edition Kevin toy – and subsequent build up to it being restocked (Aldi was forced to “grow” more Kevin the Carrot dolls to deal with demand). 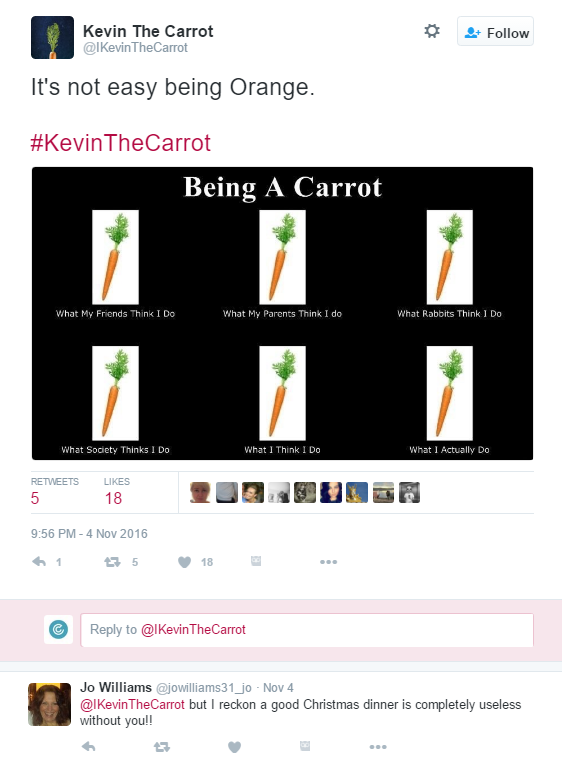 The Kevin campaign inspired and generated a lot of user generated content (UGC), which research shows can have a powerful impact on the perception of your brand. ‘Social proof’ is when people trust and copy the actions or behaviour of others, a psychological phenomenon that has been employed by marketers long before the internet. But social media platforms make the creation, discovery and engagement of UGC much more immediate and accessible. A distinctive, consistent voice is one of the hallmarks of a successful, recognisable brand. Think of Gillette’s masculine, empowering tone of voice in tag lines such as “Live life on the edge” and “The best a man can get”. Or the quirky, irreverent tone of Innocent Drinks: (on the underneath of a carton) “Stop looking at my bottom”. Aim to develop a brand personality that appeals to your target market, and reinforces the image and values you wish to convey. Tell your story: this is a marketing buzz-phrase that basically means sharing narratives about your business – its objectives, history, people, plans for the future, and perhaps the odd anecdote – that demonstrates your core values and brings your brand to life. If old school marketing is about carefully stage-managing an audience’s perception of your brand, think of content marketing as giving customers a peek of what’s happening backstage. Open, honest and willing to share the tricks of your trade. Authenticity is what will differentiate your brand and make your messages memorable – sincerity is a powerful quality that creates trust. Remember that content doesn’t need to be overtly branded or feel like advertising. The aim is to strike a balance between showcasing your brand and offering engaging, helpful content that encourages people to take action. Otherwise you run the risk of committing random acts of content. Before you unleash your inner creativity and start putting your ideas into action, remember that success is impossible without first clarifying your objectives. What messages do you want to communicate and image do you want to convey? What behaviour do you want to drive? What action do you want customers to take? How will you measure success? For Aldi, the main objective seems to be to drive footfall to its stores. If your business operates mostly or solely online, it’s likely that you’ll want to drive traffic to your site, generate leads by capture data through downloads and sign-up forms, drive conversions; and create brand awareness. Your content marketing objectives need to be aligned with your business’ overall commercial goals and support your wider marketing strategy. Don’t guess what your audience wants – keyword research is vital to inform your content strategy, particularly if your focus is driving traffic through SEO – how can you create relevant content for your audience without an insight into what they’re searching for? Google AdWords Keyword Planner is a secret goldmine of topic ideas. What’s more, you can use it to research and track the volume of searches carried out for specific keywords. Also check out Google Trends. Buzzsumo is another good tool for finding content trends and themes in your industry and sector – it’s a discovery and curation platform which allows you to identify the most shared content on social media. Treat your research as an ongoing process; it’s important to keep your finger on the pulse to pick up on emerging trends, find inspiration and act on new opportunities. According to thought leader Ann Handley, to make an effective impact, it’s crucial to “tell [your] story consistently across every channel and platform”. A well-integrated content marketing campaign requires well-defined messaging, adapted to context of each platform you use, with unified goals. Aberdeen Research has discovered that 65% of best-of-class marketers work to integrate their communications, compared with just 51% of their peers as a whole. Data-driven attribution – can we finally put ‘last click’ to bed? Quality score may only be a facet of your Ad Rank, but it’s one which has enormous impact on UX and, therefore, the bottom line. Influencer marketing integrates your content marketing, social media and SEO. Building relationships with relevant influencers who will share your content with their audience maximises your brand’s exposure to a targeted audience, while also earning you valuable inbound links to boost your site’s authority.